Why limit yourself to the beach? 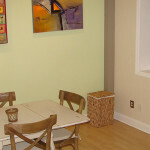 The Beacon House Inn also offers a vacation apartment rental right in the heart of historic downtown Wilmington. Only a 25-minute drive, but a world apart from beach life, Wilmington is the epitome of southern charm with a metropolitan flair. Wilmington is one of the five oldest cities in North Carolina with the largest historic district in the state. Visitors can traverse cobblestone streets lined with live oak and step back in time amongst the grand antebellum period homes. You will see horse drawn carriages and take in gorgeous views along the Cape Fear River. In the midst of all of this history lies a thriving cultural scene. USA Today has touted Wilmington as one of the brightest cultural spots in the Southeast. There are theaters large and small, art galleries, live music, and a growing culinary and craft beer scene. 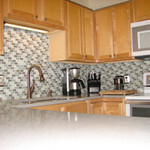 In a prime location at 17 South 2nd Street between Market St. and Dock St. is our “City Flat”! 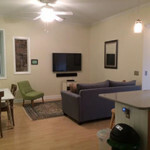 The Flat is a two-bedroom / two-bathroom second floor walk up apartment with modern amenities such as complementary Wi-Fi and a 55” smart TV. Accommodations are dog / family friendly and include one free parking space. Check out our website for photos, rates, and booking information! Make your next Beacon House vacation a “combo” with both city and surf! This entry was posted in Azalea Festival, Beacon house inn, cotton exchange, Craft Beer, Cuculorous Film Festival, culture, Family Friendly by admin. Bookmark the permalink.